Icy Bay, Wrangell - St. Elias National Park, Alaska. Icy Bay, Wrangell – St. Elias National Park, Alaska. I think I’m going to title my first book, ‘From One Disaster to Another’. I got back, safe and sound, from my most recent trip to Wrangell – St. Elias National Park, but somewhat earlier than planned. I’ll tell it to you over a few posts, starting here. I flew from Anchorage to Yakutat, a small town down on the coast, in northern South East Alaska. I was aiming to go from there to Icy Bay, an inlet on the Gulf of Alaska, and one of the few areas where the park touches the coast. I’d heard bits and pieces about the bay over the years, but knew very little about it. Everyone who’d been simply said ‘Oh, you GOTTA go to Icy Bay’. I’ve always been one to do as I was told, so, in time, I headed for Icy Bay. So I arrive in Icy Bay. I go paddling, hiking, swimming, and generally have a good ole time. There’s not much that beats being in a place like Icy Bay. I’d have to agree with the recommendation above – you do gotta go to Icy Bay. 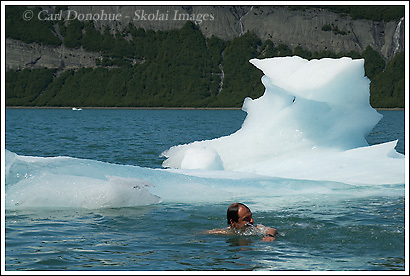 And how can you go to a place called ‘Icy Bay” and not swim in the bay? 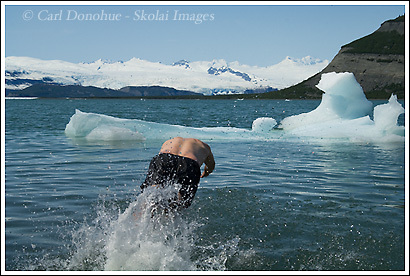 So here’s a couple of images of me swimming in Icy Bay. Truth be told, it wasn’t really that cold. Stay tuned. It gets better. 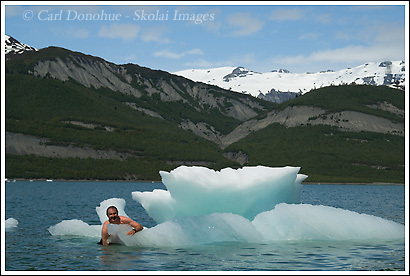 This entry was posted in Adventures, Alaska, Backpacking and Hiking, Kayaking, Wrangell - St. Elias National Park on June 22, 2008 by Carl D.
Man, it sure LOOKS cold! Are you a member of the POLAR BEAR CLUB??? I hope you do write a book eventually. I’d be the first to buy it!! Stay safe as always!! Looking forward to more on your trip. Carl, sometimes I wonder about your sanity!! But you sure are loads of fun & surprises!! Too much fun. Entirely too much fun. You know, I find it pretty easy to not swim in a place like this! 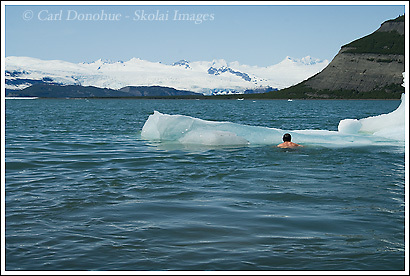 The funny thing is, when you mentioned on the phone that you went swimming in Icy Bay, my first thought was that you fell in! Didn’t think you would do it on purpose. You are crazy man! And that is coming from someone who has swam in the Copper River! Ron, you mean ‘fell in’ like out of my boat? Like, my boat flipped and I swam? Dude, that just ain’t gunna happen. 🙂 You swam in the Copper River? Now THAT is crazy. Totally crazy. 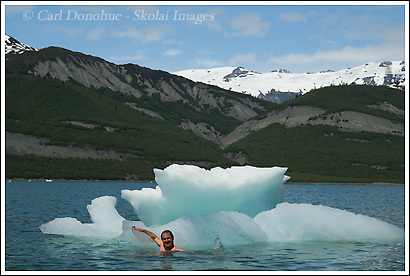 You folks up in Alaska have some pretty strange ideas for jacuzzi tubs. Ya know what the funniest part about this is? I had to shoot these using the timer on my camera – which means after each shot I’d have to swim back to shore, get out, check the photo, reset it up and shoot again, jump back in, etc. Tons o’ fun! I noticed you don’t have any pics of your big fat lizard pose! Hey Carl, all I can do is laugh! You are loads of fun & surprises!! I would have liked the lizard photo!LOL.